Andie Easley: Hey I’m Andie! Alisa Easley: And I’m Alisa Easley, her Mom! SpotlightMe.tv came to Andie’s home and away games and they would videotape the games. We had videotaped off and on in the past but we never did anything with it or had or was able to even get a game downloaded by ourselves. They went to the games and had the games downloaded within about 24 hours where we could watch the film. Having the game-film was everything in our recruiting process. We had no prospects for Andie no college offers very few contacts but everybody pretty much put her on the back-burner because we didn’t have anything about her condensed into one easy, easily obtainable site. It was all just bits and pieces. 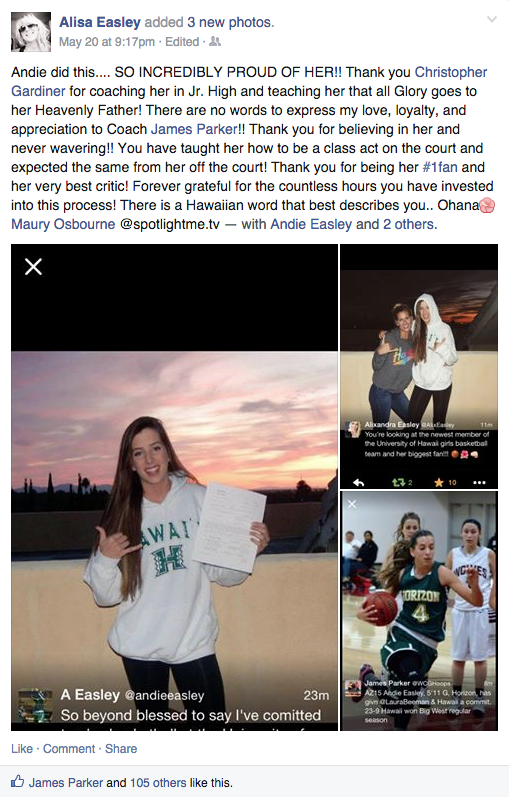 And at the end of her senior year spotlightME.tv downloaded her highlights and some things about her and videos and full games all on one website, and put it out there. And within 24 hours we had our first official full ride offer and in the last 7 days have had offers for visits all over the United States like we are completely overwhelmed in a good way. Andie: For a while, like in the beginning of the season, and towards the end we were completely stuck with recruiting. Because coach’s had no way to see me play or show the head coach’s or other assistant coach’s that I could play. So then once I got my website AndieEasley.com any coach could look up my name in google and find my website easy. And any coach that I gave my name to could easily watch me play and any coach that had been in contact with me but didn’t have game film now had plenty of game film to show other coach’s. Alisa: We had gone and invested thousands of dollars in a national recruiting company and literally all we got in the last 4 years were text messages from them. There was no personal contact, no phone contact, no email contact, just a few text messages. And so part of me was a little bit leery but I, obviously it’s been the best investment of our lives. Coach James referred us to this company and I’m grateful for him on so many levels. He has believed in Andy since the day he met her. He’s believed in a lot of kids and he’s changed kids lives. Young girls lives. And, he doesn’t take enough credit. But he should. He’s a humble man. And I owe everything to him. Without him, we wouldn’t be here and have this opportunity. Without him we wouldn’t have met spotlightMe.tv and I honestly don’t know if Andy would have even gotten to Junior College at this point. And now we have big schools all over the United States literally knocking our door down. Forever thankful. 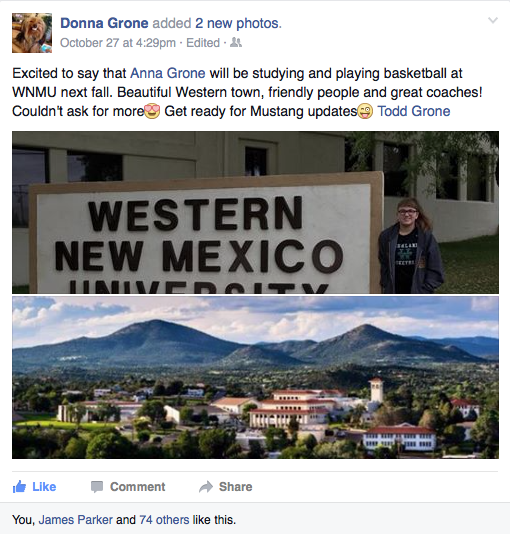 Andie: Coach James Parker has always believed in me, and he’s always wanted the best in me. And he’s tried his hardest to help me with the recruitment process, and it was just really slowing down. And so, as soon as he told me about spotlightME.tv and he referred it to me, I trusted him. And I believe he wants whats best for me. And it’s really was what’s best for me. And it’s helped me so much with recruitment and college and my future. If I were mentoring anybody or met anyone who wasn’t getting the recruitment opportunities that they deserved like I was. Then I would definitely recommend spotlightME.tv and Coach James Parker. That’s probably the only advice I would have. Because that’s really what helped me. And the only thing that’s gotten me where I am. All I had to do was play the game really and they got it all covered for me. Alisa: If there was one thing I could say to another parent or a talented child. I would say that this is a must. Call Mauryo! Call James! What they can do for you, will change your life! Our websites pay for themselves on DAY 1.